Her research career took Deniz Tasdemir to many different places. In Kiel at the GEOMAR Helmholtz Centre for Ocean Research she feels especially close to her main goal: She conducts research on natural compounds from the ocean that might heal patients in the future. 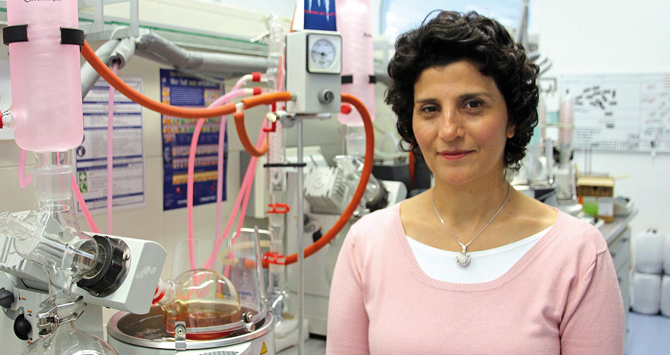 Deniz Tasdemir was a successful contender for her professorship in the Helmholtz Recruitment Initiative for excellent female researchers. Today, she is leading the newly established Research Unit Marine Natural Products Chemistry at GEOMAR. "The fact that GEOMAR has excellent facilities for accessing organisms from coastal or deep sea with research vessels, robotic devices and submersibles, which are crucial for my research, was a key aspect for my decision-making.“ Particularly the deep-sea fascinates her. “Hunting for new compounds from deep-sea animals and deep-sea sediment bacteria dominates my research.” Since those organisms cannot be easily accessed, there is very little known about them. Diving in such a depth is not possible for humans; therefore researchers need robotic devices in order to collect deep-sea organisms and the sample is monitored by a computer on deck. Marine natural products are substances that play a crucial role in the complex, competitive marine ecosystems. They enable chemical communication between organisms and are also used for catching prey, as chemical weapons against predators or for protection against harmful UV rays. These chemicals can be produced by marine invertebrates and algae as well as by microorganisms that live in symbiosis with them. Research on those compounds has a short, but very successful history. Already seven compounds have reached clinics and many are undergoing clinical trials. “The competition for Helmholtz Recruitment made me aware how much I feel at home here in Central Europe”, she says. She likes living in Kiel. After having lived in many different places like Ankara, Zurich, Salt Lake City (Utah, USA), London and Galway (Ireland), Kiel seems to have just the right size for her. Sometimes, she wishes that some shops were open on Sundays. But apart from that, she very much enjoys her life: “What I like and value highly here in Germany, is the transparency and how straightforward people are without being impolite.” Not least, she loves German bread and the fact that she can easily get Turkish food here.